YELLOWSTONE NATIONAL PARK, Wyo. -- The mist was lifting on Fishing Bridge, where an elk forded the river upstream. I stood on the bridge and watched, the sole witness, as he crossed the current, strong and swift. It was shortly after 7 a.m. When I got in the car and prepared to move on, a bison wandered onto the bridge. A motorist eager to cross edged toward it. But bison do not behave like cattle. A muscular, one-ton muddle of dreadlocked fur, the bison bucked and snorted. The minivan conceded. Meanwhile, cars and RVs had accumulated on both sides of the bridge. The bison ambled across, instigating the day's first "bear jam," a term coined by rangers to describe the gridlock caused by wildlife-watching in high season. Last year almost 2.9 million people visited Yellowstone National Park, and many did not stray far from their cars. According to Nathan Varley, a wildlife biologist who grew up in the park as the son of a fisheries biologist, "It's a road park. Around 95 percent of all visitors to Yellowstone are traveling through on the road and hitting the main attractions." For a nature lover it can be daunting. Old Faithful's parking lots make Wal-Mart's look rinky-dink. Most visitors drive "the loop," a 96-mile trundle through changing landscapes of lakes, thick stands of lodgepole pine, geysers, mud holes, and giant meadows where you can see herds of bison or grizzly sows and their cubs. The country's first national park, Yellowstone may still be its greatest. But how can a high-season visitor lost among the throngs get personal? "Solitude is important and healing. It gives us a chance to reflect," says Norm Bishop, the park's former resources interpreter, now retired but back for a visit. Bishop is a park icon who was instrumental in bringing the wolves back to Yellowstone. He returns frequently to cross-country ski, revel in the wilderness, and teach others to do the same. "Go half a mile from any parking lot or road," Bishop says, "and you'll have it all to yourself." If only I had had that advice a few days earlier. Following the signs to a turnoff called Petrified Tree, I drove a long, narrow road (the first I saw that was prohibited to RVs). Hopeful, I continued along, only to get funneled into a narrow, car-filled parking lot. The attraction a few yards beyond was a beautiful remnant of a petrified tree, blocked off by an iron fence. A dozen of us stood there, trying to angle our cameras to exclude the iron bars. We spent an equal amount of time making three-point turns out of the lot. Talking with locals is another way to coax out the gems that didn't make the greatest hits list. 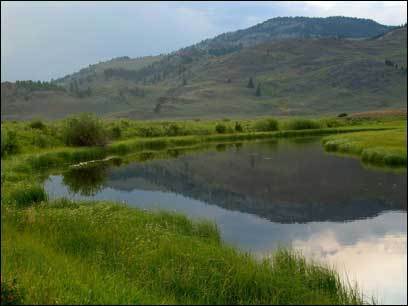 I heard a lot of buzz about Lamar Valley, in the northeast corridor of the park and renowned for wildlife. If you've seen a documentary on Yellowstone, chances are it was made here. It also has geography in its favor. Those approaching from the south must come off the loop and climb 8,859-foot Dunraven Pass. Most RVs and campers forgo the steep and winding road, resulting in delicious solitude for those who choose to ascend. Bear spray in hand, I set out for a hike in Lamar. Markings were few; a trailhead said Specimen Ridge. I was alone, or at least I thought so. A pronghorn barked in my direction, the call loud but hollow. Resembling an antelope, it stood tall and slim, its white muzzle squared at me. I looked around to figure out what the fuss was. Ten minutes later I realized: Its fawn was grazing nearby, almost undetectable in the tall grass. I crept away and then made an arduous climb to get open views of the green hills. That route led to remnants of a petrified forest captured in volcanic eruptions 50 million years ago. Without any signposts to lead me to the spot it felt like a spine-prickling discovery. Taking a course is another way to delve more deeply into the park. The Yellowstone Association, also in Lamar Valley, is a private nonprofit offering educational programs for individuals and families. Instructors in subjects ranging from poetry to ecology teach small groups about the park. It's an intimate experience, made more so by the simple log cabin campus of the Buffalo Ranch. Diane Orme of Ten Sleep, Wyo., has been coming to Yellowstone almost every season for the past eight years. "Wolves: Reality & Myth" was the ninth Yellowstone Association course she has taken. A sheep producer, Orme became fascinated with what she calls "the bigger picture" when she first saw a wolf pack on a ranger-led walk. "The instruction is top-notch," she says. "And those you're sharing it with are equally excited." Course participants, among them retired schoolteachers, a professor, and an astronomer, set their alarms for 4 a.m. in order to climb into the institute van and search for wolves. An hour later, I join them to meet other hard-core wolf enthusiasts at the high pullouts on Chittenden Road. Clad in hats and mittens, their kids still in pajamas, they man spotting scopes, gazes fixed intently over the broad valleys below. "See anything?" the newcomers say. "Just grizzlies," comes the response. As if that were nothing. But on the second morning, there is something. First, a sole female elk wanders the edge of the woods. Then someone spots a wolf with the elk's calf. We watch as the cow runs the wolf off the carcass, but the wolf repeatedly returns. They continue this dance for 10 or 15 minutes. The drama takes place a mile away, but with the spotting scope, it is up close and vivid. I am absorbed, amazed. I could never have imagined the resilience of this elk that had lost her calf. Bishop, who is visiting the class, shares his scope with a 10-year-old boy who is shyly standing by. Bishop reflects, "The primary value of Yellowstone is to learn the general principle that everything is connected." While the wolf might seem like the culprit, it will probably bring the carcass home to feed its pups. Varley teaches that wolves have restored balanced ecology to Yellowstone, helping everything from culling elk overpopulation to the regeneration of willows. It's an overarching lesson that Bishop sums up: "If we don't get that notion of interdependence, then we are ill-equipped to make decisions." This kind of immediacy is rare. I am struck by the camaraderie of the wolf watchers and the awe I feel witnessing the natural world, live. I finish my trip in the most remote part of the park: Bechler (pronounced BECK-ler), in Yellowstone's southwest end, accessible only by Idaho county roads and a dirt access track. While it is the park's premier hot springs soaking destination with the highest concentration of waterfalls in the park, Bechler gets only 5,000 visitors a year. Maybe it's the difficult access. Or its fame for mosquitoes. According to Park Ranger Tom Wilkinson, it is primarily a destination for equestrian tours and Boy Scout trips. Because August and September are the driest months, they are also the most popular time to visit. This kind of destination gets visitors off the beaten path from the start. The drive to Bechler (dubbed Cascade Corner for the many waterfalls there) passes through potato country, undulating green hills marked by the occasional grain elevator. A day hike takes me to Bechler Meadows, an 8,000-hectare meadow that is home to every important type of wildlife in the region. I follow the slow river that snakes out of the meadow to Bechler Falls and then Cave Falls, where it becomes a magnificent crashing force. Below, there's a wading pool. On the whole hike I see no one -- only mosquitoes. That's OK with me. You can't apply people repellent, but they do make bug repellent. I decide to stay, until the whole forest glimmers gold with the falling sun. Carolyn McCarthy, a freelance writer based in Chile, can be reached through travelwriters.com/carolynmccarthy. Travelers can get to Yellowstone National Park through Jackson Hole (56 miles) and Cody (52 miles), Wyo., Bozeman (65 miles) and West Yellowstone, Mont., and Idaho Falls, Idaho; all have regional airports. American, Delta, Northwest, and United fly from Boston to Jackson Hole with one layover. Offers specialist-led field seminars and courses ranging from art to ecology. A friendly, refurbished downtown motel with homemade cookies to greet you. High season doubles $129 with continental breakfast. A lovely Scandinavian-style bed-and-breakfast two blocks off the square. High season rooms $175-$285 (doubles and suites) with gourmet breakfasts. Wonderfully scenic riverside spots near the Bechler area, 23 miles from Ashton, Idaho. Campsite $10 (second vehicle $5 extra). In the heart of Lamar Valley. Go early; sites are first-come, first-served, $12. Healthy Mexican fare at a hopping roadhouse. Live music or dancing nightly. The specialty: tacos al pastor with achiote sauce $6-$9. Jackson goes urban and upscale. Locals like the steak frites with béarnaise butter, $6-$25. Sunday-Thursday 5:30-10 p.m., Friday and Saturday till 11.
nps.gov/yell Yellowstone National Park's official website offers detailed information.